NanoWorld MFMR AFM probes with a hard magnetic coating were used for the magnetic force microscopy measurements described in this article. Figure 5 from “Magnetization-polarization cross-control near room temperature in hexaferrite single crystals” by V. Kocsis et al. : Real-space magnetic force microscopy (MFM) images. The MFM images were taken on the same 10 × 10 μm2 region of a BSCFAO crystal with an ac face (see Supplementary Figs. 3, 9 and 10) at room temperature. Prior to the MFM measurements, the sample was poled to a single-domain ME state using (+E0, +H0) poling fields in a E ⊥ H; E, H ⊥ c configuration. Panel a shows the changes in the magnetic domain pattern caused by two successive applications of the E field with different signs (the initial state is labeled as the 0th). The images include small regions, R1 and R2, where two representative cases of DW motion are observed. 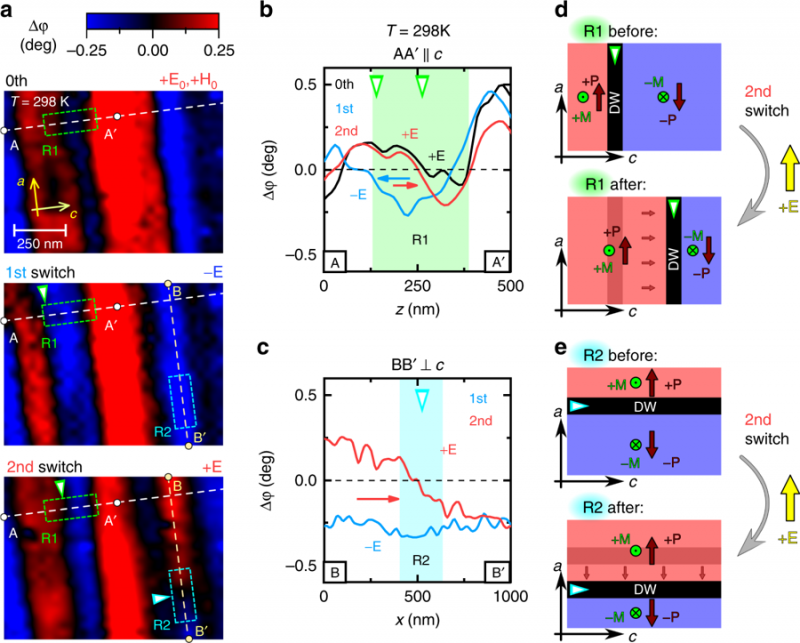 Around R1, the negatively magnetized domain (denoted with blue color, MFM phase shift Δφ < 0) expands and shrinks along the c-axis upon the first and second applications of E-field, respectively. On the other hand, around R2, a positively magnetized domain (denoted with red color, Δφ > 0) is pushed into the view area from the upper side along the ab plane. These two cases are further displayed as line profiles of the MFM phase shift (Δφ) data along the b A−A′ and c B−B′ lines. Panels d, e show the schematic illustration of these two cases of domain wall motions for the second E-field switch, respectively. Open Access The article ” Magnetization-polarization cross-control near room temperature in hexaferrite single crystals” by V. Kocsis et al. is licensed under a Creative Commons Attribution 4.0 International License, which permits use, sharing, adaptation, distribution and reproduction in any medium or format, as long as you give appropriate credit to the original author(s) and the source, provide a link to the Creative Commons license, and indicate if changes were made. The images or other third party material in this article are included in the article’s Creative Commons license, unless indicated otherwise in a credit line to the material. If material is not included in the article’s Creative Commons license and your intended use is not permitted by statutory regulation or exceeds the permitted use, you will need to obtain permission directly from the copyright holder. To view a copy of this license, visit http://creativecommons.org/licenses/by/4.0/.